In this post I am going to show how we can deploy content type declaratively (through xml) with fields using known GUIDs. One of the challenge with the look up field is that it binds to Lookup list via ListId (i.e. GUID). There are couple of ways you can achieve this. 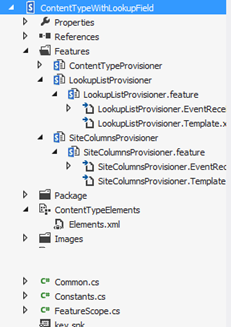 One is to use SharePoint Object Model to create fields and content types via Feature code. First you need to create the lookup list via site scope feature. You might be thinking why I am creating a list in site scope feature? The reason is simple I just want to create the lookup list in root web of the site collection and that will be accessible to site columns.